While we in Connecticut may have become numb to our last place finishes on state rankings, the latest study shows just how unprepared the state would be if it were hit by another economic downturn or some other crisis. The study, published by the Mercatus Center at George Mason University, ranks Connecticut in last place out of the 50 states for “fiscal condition.” The rankings for this study take into account things like how much debt the states carry, whether they have a decent rainy day fund, and whether or not they can pay their bills in the short- and long-term. While Connecticut came in last among the states, we were ahead of the U.S. territory Puerto Rico, which is essentially bankrupt. The Mercatus study shows that Connecticut is not prepared to weather a shock to its finances – whether the shock comes from a recession, another surge in outmigration, or from corporate inversion. 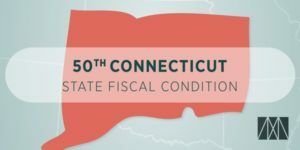 Connecticut is unprepared because it is plagued by debt – both bonded debt and huge pension and retiree health care liabilities. It is one of only four states that do not have enough assets to cover their liabilities. Connecticut has also almost completely depleted its rainy day fund, which is even more true after lawmakers chose to raid the fund to close the $260 million deficit for FY 2016, which will end June 30. The report, authored by Eileen Norcross and Olivia Gonzalez, shows signs of “fiscal stress” or “structural financial weakness” in the 50 states. We may just have gotten through a tough budget session, but this study – and the many others like it – show why there are many more to come.